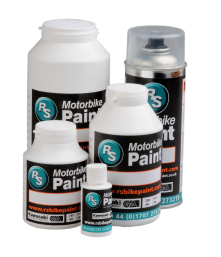 RS Bike Paint specialise in motorcycle paint and scooter paint for touch up, aerosol and spray gun use. We provide paints for all makes, including Honda, Piaggio, Vespa, Harley, Suzuki, BMW, Yamaha, Kawasaki, Triumph and Ducati. Our database of over 25,000 paint formulations enables us to match the original colour scheme of your motorbike without the need for a paint code. Our paint database covers motorcycles and scooters manufactured between 1902 and today, and includes ancillary colours such as engine and frame paints as well as main tank and panel colours. All paints are available in small touch up bottles suitable for repairing stone chips, aerosol cans for larger repairs and 250ml upwards for spray guns. We also supply all the preparation and refinishing products that you will need to complete the repair of your motorbike paint, scooter paint or classic motorcycle paint. We know that the majority of motorcycles are not coded, so our database does not rely on you providing a paint code. All you need to do is tell us the year, model and manufacturer of your motorbike. Our extensive online bike paint database covers 112 makes and 2936 models of bikes and scooters. This website is a one-stop-shop that enables you to identify the exact finish required for your bike, and purchase the necessary paint, basepaint and lacquer along with all of the preparation and refinishing products that you will need to complete the repair of your bike. You can place your order online and pay by credit/debit card or by Paypal. We have very competitive delivery rates across Europe. Because most paints are classed as dangerous goods, we usually use a courier. We aim to dispatch all orders within 72 hours.